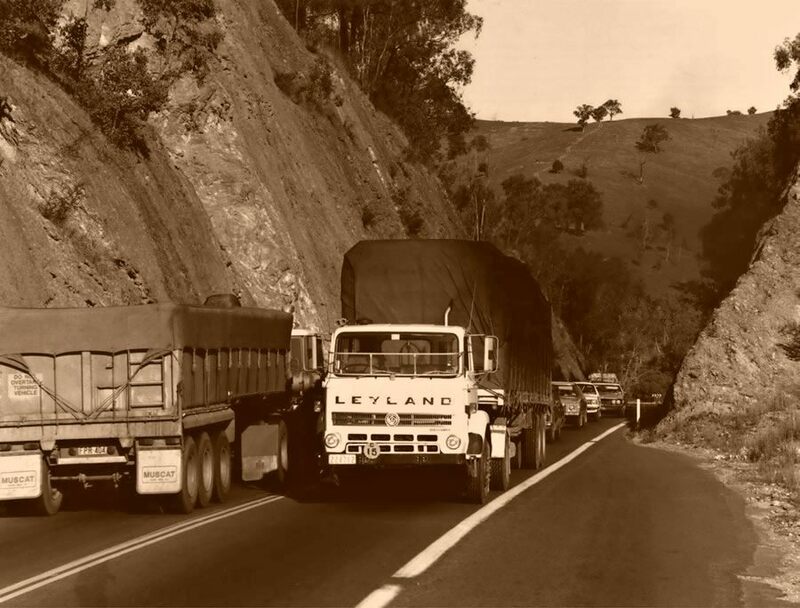 The notorious Hume Highway at Sylvia's Gap (between the Snowy Mountains Highway junction and Gundagai (the Layland truck is heading north towards Gundagai) - August 1982. This deviation was built in 1940 and has itself been replaced by the dual carriageway that now runs fron Sydney to Melbourne. 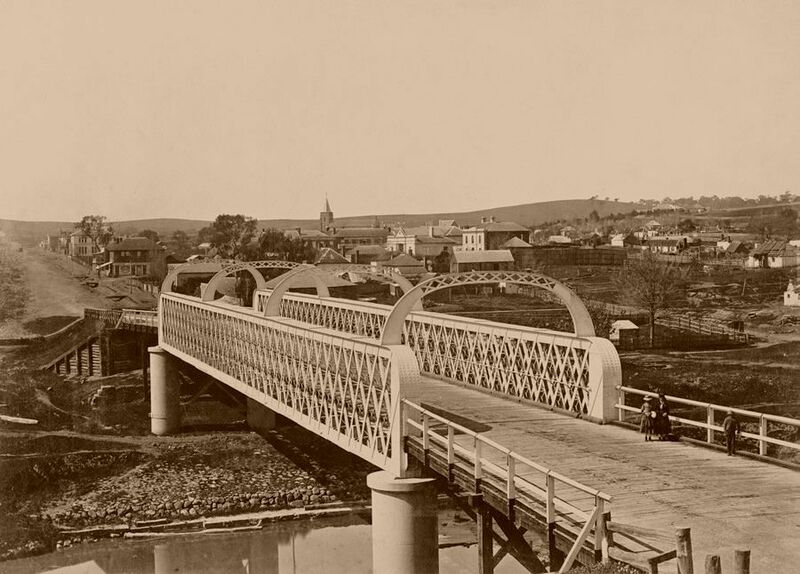 The bridge at Yass in 1876. 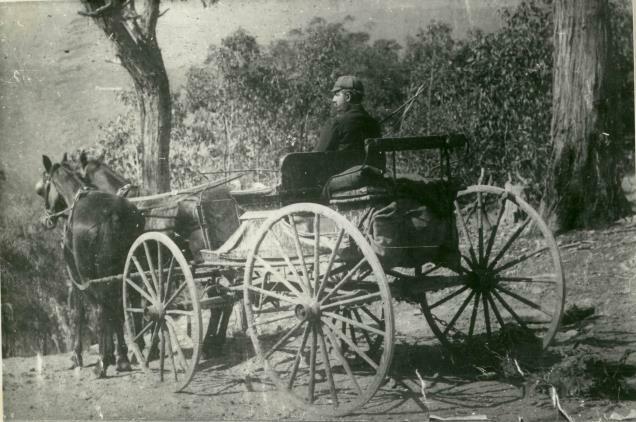 It was opened in 1871 for animal drawn vehicles as the Hamilton Hume Bridge - it later became part of the Hume Highway and remained so until the late 20th Century. It is still in use today (2015) for local traffic. Trucks head south as they start the climb out of the village of Jugiong on the Hume Highway.1995. 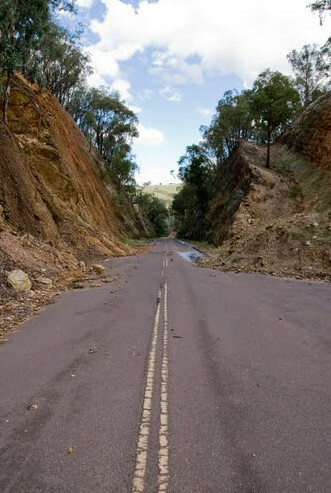 The Hume Highway (The Great Southern Road). About to descend Talbingo hill. Notice the chain at the back. This was to slow progress by dragging a log. Eventually the practice had to be banned as it was destroying the roadway. Mr. Wilson asked the Secretary for Lands, "Whether it is the intention of the Government to order the survey and formation of a road into Kiandra, the newly-discovered gold-field?" Mr. Black replied that, according to the accounts received from the new gold-field, it was not improbable that the Government might deem it proper to take some such step as that suggested by the hon. member; but at present the information was necessarily very imperfect, and the Government would await further intelligence from the Commissioner of the Southern Gold-fields. The government having determined on erecting a bridge across the Tumut River in Wynyard street have called for tenders for the same. The whole of the contracts from Adelong to Wagga Wagga via Nacki Nacki have been tendered for and accepted by Mr W. G. Osbaldiston. A portion between Adelong and Nacki Nacki is now passed, and ready for traffic; the engineer has been over the work, and states that it is effectively performed. Those unacquainted with the district have little idea of the work done in this locality; many of the sideings have been cut down and from the great hill near Sandy Creek a great deal of stone has been removed. 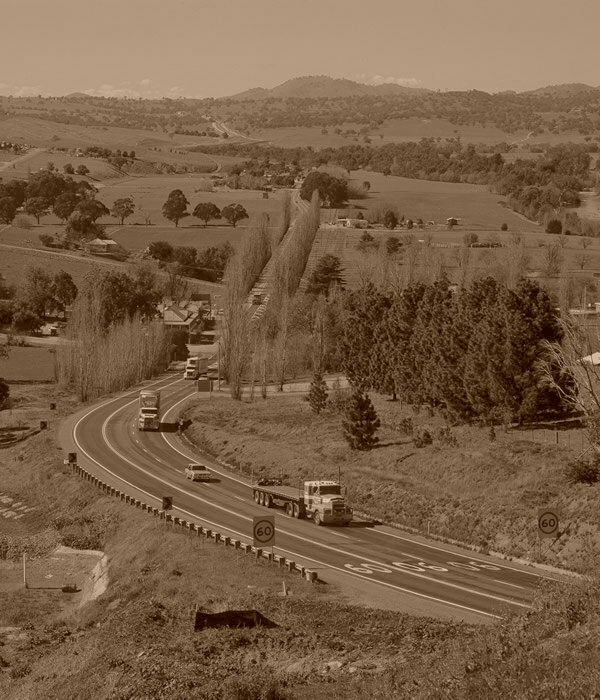 NSW State Highways were classified for the first time in 1928 - to read more, click here. As part of this structure the Monaro Highway ran from Wagga through Tumut, Kiandra and Comma to Tathra. Today, the Monaro Highway is called the Snowy Mountains Higway and starts at the Hume Highway (not Wagga). At the recent meeting of the Gundagai Shire Council a letter from the Department of Main Roads, Wagga, dated September 27 advising, that as the southern section of the Tumblong-Tarcutta deviation had been completed, the department was handing back to council the sections of the former State Highway which did not now carry through traffic. The sections referred to include that portion of the old State Highway 2 (Monaro High way) from the Kyeamba-Gundagal Shire boundary to the junction of State Highway 4 (Hume Highway) and thence to its junction with the new deviation. Preparatory to handing over the roads were graded by the Department of Main Roads' plant and council will henceforth be responsible for all future maintenance. On a motion proposed by Councillor Chandler, it was decided to have an inspection made by council engineer, who will report on any repairs which he considers necessary. 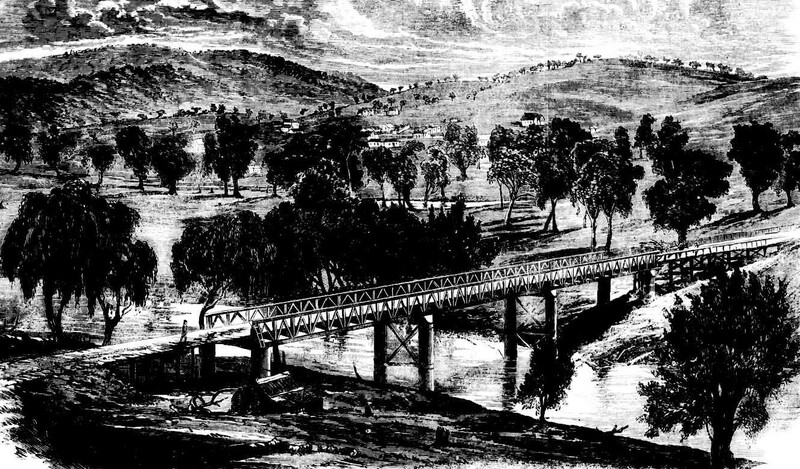 Alfred Bridge over the Murrumbidgee at Gundagai, 1868.